We have all heard the famous line by Meg Ryan in You’ve Got Mail…”Don’t you think that daisies are the friendliest flowers?” For all of the people connected to Venice MainSteet – Board of Directors, Business and Community Partners, Downtowners, a slew of volunteers, and the staff – we like to think that Venice MainStreet promotes the friendliest kind of fun on the island. The City on the Gulf can’t speak for itself, but the people can. Throughout its 30-year history, Venice MainStreet (VMS) has set its sight on bringing people to beautiful Historic Downtown Venice to have fun. From the moment travelers land at Sarasota Airport, they are welcomed with an 85-foot long mural promoting Venice. A robust weekly e-newsletter informs over 10,000 residents and out-of-towners about what’s happening in Venice. Visitors are greeted with smiles by the all-volunteer Downtowners who operate the Centennial Park Information Kiosk and stroll the avenues. These cheerful folks act as goodwill ambassadors answering questions, offering directions, and providing tidbits of Venice history and trivia. People come from all over to attend the Blues, Seafood, and Arts & Crafts Festivals. A wide range of musicians entertain residents and visitors with free Friday night concerts held in the Gazebo. Kids of all ages love to partake in the annual Easter Eggstravaganza and Halloween Parade. Passersby grin from ear to ear as they watch the children squeal with delight as they splash through the Intergenerational Fountain located in Centennial Park. 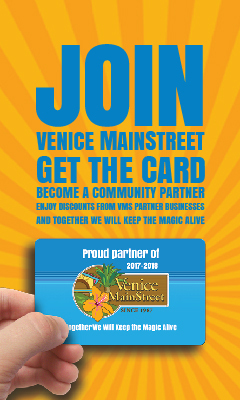 The Business Partners and Community Partners who join Venice MainStreet are proud to be a part of a fun organization that promotes, preserves and protects Downtown Historic Venice. These Friends of VMS are committed to being an integral part of the VMS Family through their annual partnership, contributions, sponsorships, and volunteer efforts. They find the fun in helping to fund the variety of events organized by Venice MainStreet with their financial support and their hands-on involvement. Likewise, the Community Partners who join VMS play a big role in the continuing success of this 501c3 non-profit organization. They spread the word about all the good things VMS does for the City on the Gulf. 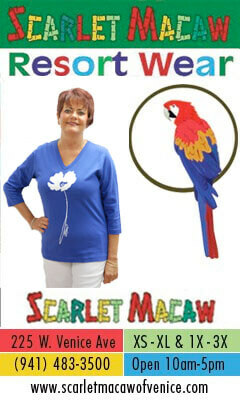 They become engaged and volunteer at the festivals and special events. Through connecting with other community partners, they expand their friendship circle. The City on the Gulf.